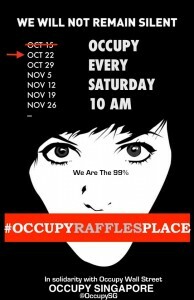 This post is part of our special coverage #Occupy Worldwide . It seems Singaporeans are preoccupied with something else because nobody showed up in the OccupyRafflesPlace  event which could have been the Singapore equivalent of the Occupy Wall Street protest. Raffles Place is Singapore’s financial district. Some blamed the protest failure to the threat issued by the police  against those who will join an illegal public demonstration. Lucky Tan said the no-show in Raffles Place reflects  the ‘repressive political climate’ in the country. The organizers have already apologized  for the failure of the protest. They promise to organize a bigger and better action next time.